March | 2014 | From Student to Teacher. After throughly researching this topic my answer would be yes, providing it is used in an appropriate way and that there is a system such as quad blogging put into place, where it is ensured that all children will get some response so they can feel like they are writing for a purpose and also see what others think of what they have found out. There are some key things to remember when blogging to ensure it is used effectively and appropriately. 6. Finally, in my opinion the most important – keep the blog going and perhaps set a day of the week in which the blog should be posted day, have ‘monitors’ put in place to ensure that it is kept up to date but this responsibility is swapped around every 2 weeks or so. Saturation week couldn’t have come at a more perfect time for me, it was just the reminder I needed of why I’m actually at university. It feels to me like university can sometimes become so focused on passing exams and assignments that I actually forget the real reason I’m here and what I will achieve by time I leave, the opportunity to teach and inspire. During saturation week I was based in a year 5 class, before starting I was very reluctant as I didn’t really know what to expect as I’d never worked with children in this year before but as the week progressed I began to really enjoy working with that year group. Because the school was a fairly large school, we all had the opportunity to be individually placed in the classroom, this acted as a huge benefit for me as it gave me to opportunity to get to know the children better in order to be able to fully meet their needs and have a more holistic understanding of how the classroom worked and why things were done the way in which they were. Working individually also gave me several opportunities to take the class register and lead and plan group activities. Our main focus on the week was looking at perspective images and how through the use of overlapping, size, lines, etc, we could make distance within an image. At first, some children struggled with the concept but as the week progressed all children began to feel comfortable with what they were doing and this showed in their work. I was given the opportunity to be able to teach a group activity and because the focus on saturation week was non core subjects I thought it would be beneficial if I was to incorporate the work they had been focusing on that week into my activity. The activity I planned was based around a poem called ‘Where go the Boats’. 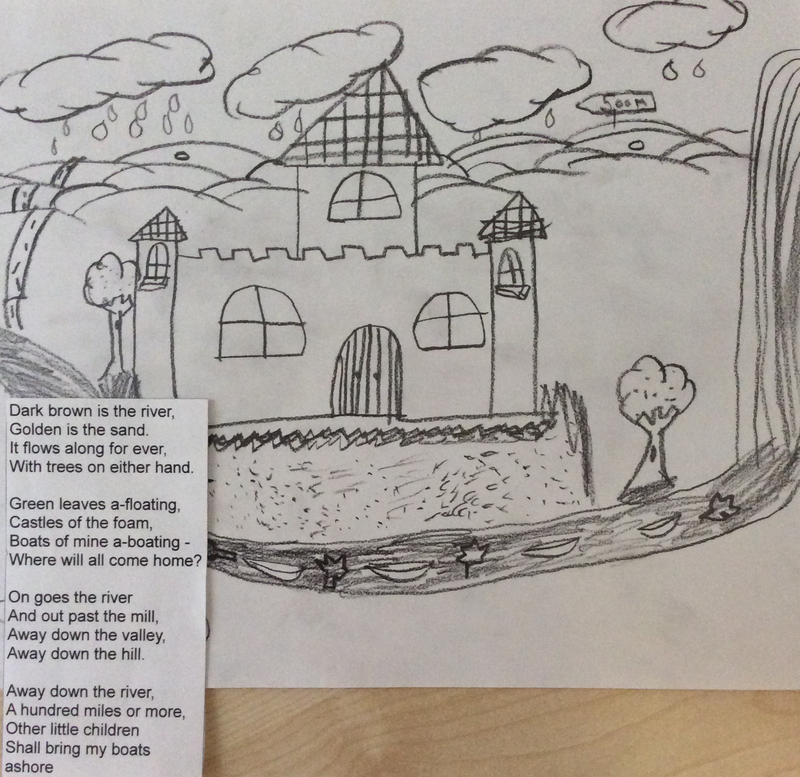 The first focus of the activity was for me to gather ideas and thoughts the children had on the poem. I first read the poem to the children and asked them to work independently writing down any key adjectives or images they saw in their heads on a whiteboard, we then shared these ideas and discussed them further, this also gave the children who were struggling the opportunity to reflect on other peoples ideas. 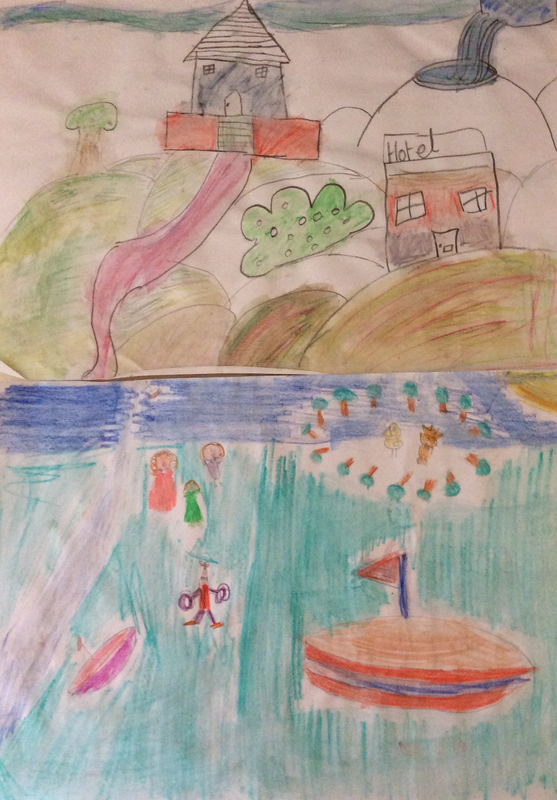 I then introduced the idea of drawing a perspective image about what the children saw in their heads. We also did a quick recap and overview of the things you need to take into consideration when drawing a perspective image. The children were then asked to close their eyes while I read the poem once more. Because the children now knew the objective and had gathered each others thoughts, the images and ideas we discussed the second time became a lot more focused and clear. 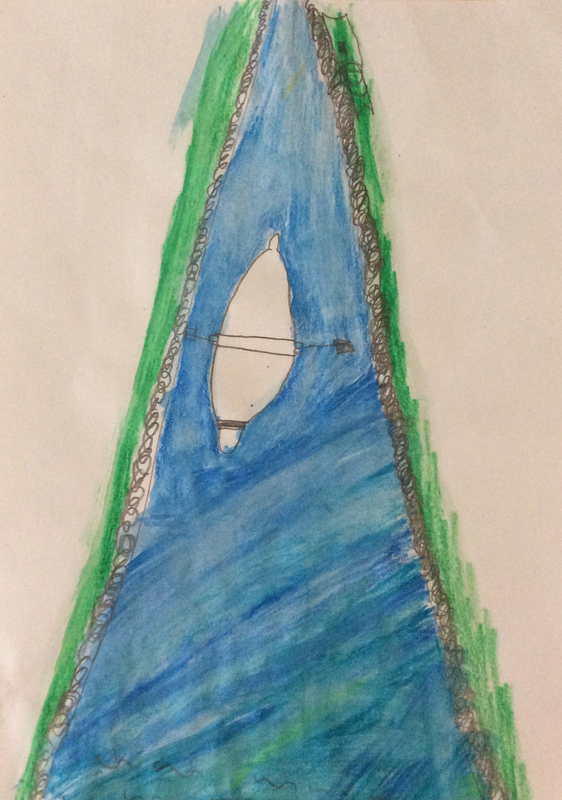 I then gave the children a time limit of how long they could take drawing their image and if they had finished or nearly completed in this time, they could add detail and colour using water coloured pencils. This acted as a motivational device. Whilst they were carrying on with their work, we had a discussion whether they liked the poem and why and if they would change any of their ideas after seeing each others finished piece. A key focus for me to put across to the children was that each of them would interpret the poem in a slightly different way and that no one had a right or wrong answer. This then had a positive impact on the way they approached their work as they understood that if there’s was different to the persons next to them it wasn’t a bad thing. Saturation week, for me, was probably the most positive school experience I had so far as I felt comfortable and welcome in the school I was in. Both the staff and the children were exceptionally lovely which made me feel more confident in what I was doing and therefore made me feel like this is the placement I have got the most out of so far, both personally and professionally.